Last night I was finishing up some work for the week and I had a bit of a freak out. Not to do with volume of work or nature of work, but to do with the actual content of the journals and magazines I was reading. This week, two gems stood out for their utterly depressing content against the usual background noise of economics and politics and recommendations for acceptable levels of violence to use against offenders and rehabilitation of the massive U.S. prison population. One was a serious academic journal called Child Abuse and Neglect, the title of which I'm sure says it all. The second culprit was Onearth, which had its usual litany of ochón ochón the sky is falling articles, including a big article about bitumen extraction in Alberta--cheery stuff, I'm sure you agree. Then, last night, I read this article in the New Statesman and I just got really upset by it. It was the last straw. So I left the work unfinished and came downstairs to immerse myself in the harmless world of movie trailers. 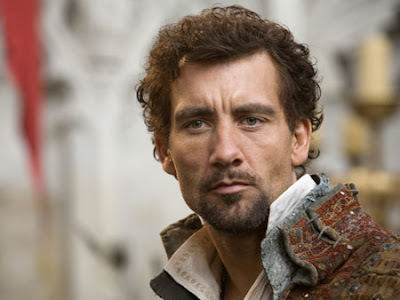 And that's where I got my first look at Clive Owen being Sir Walter Ralegh. Look at him! And... AND! as if that wasn't enough, he's on a ship in one clip. You can see it too!